This section is for the youngest Brigade members and is named after the Brigades patron saint St Martin of Tours. The Martins have a fun filled badge scheme with an exciting programme of games, interactive stories, crafts, drama, singing, funsheets, puzzles and activities. These follow three themes, Me and Others, Me and God, Me and Gods World. 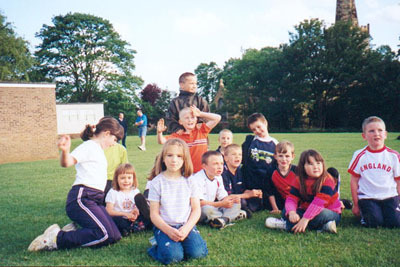 Along with this Martins can enjoy games with older members and activities with other groups. A Martin is a boy or girl who is learning to love and follow Jesus, is kind and helpful to others, and enjoys God's world and looks after it. A specially designed package of resources has been developed to cater for the needs of this age group. There are badges and certificates which the children can achieve through a weekly programme. Leaders' Guidelines offer further help and advice in every aspect of working with this age group. A sweatshirt with the Martins' own logo is available from Headquarters. This helps to give the youngsters a sense of belonging and identity. "We play games, play on the computer and do painting. My best bit was making the chocolate cake."